It was still dark when I pulled up to the ramp at Fletcher’s Cove in Washington, DC, but anglers were already loading up rowboats, getting ready to head out to pursue shad and striped bass. As I approached the boats to find one with a good rock I accidentally blasted Alex Binstead and Mike Bailey in the face with my head-mounted flashlight when they said “good morning” to me. 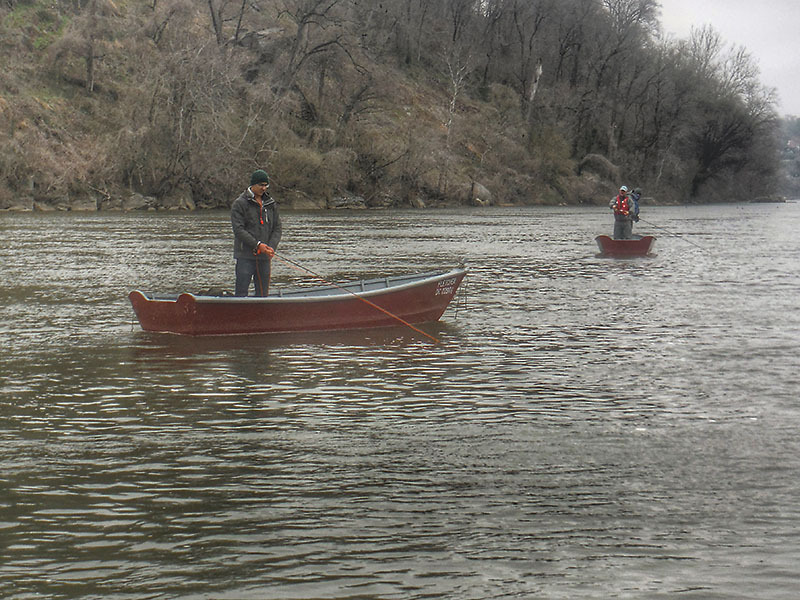 We exchanged some fishing information as I loaded a boat and in a few minutes I was anchored just outside the main current seam on the Potomac River. It was a cool, overcast day. I was layered up so being cold wasn’t an issue. 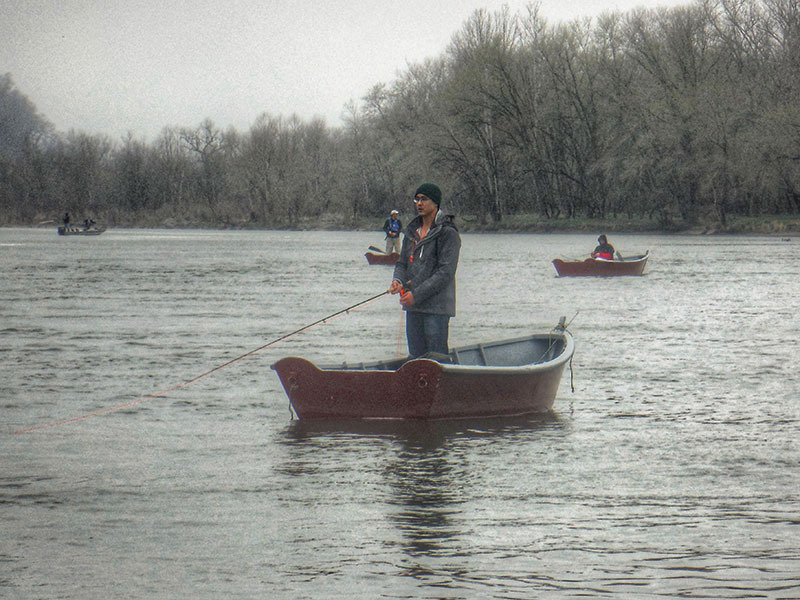 What was becoming an issue was the difficulty finding where the shad were holding. The drop in temperature had affected the bite, so I went into a search pattern as I tried to locate fish. 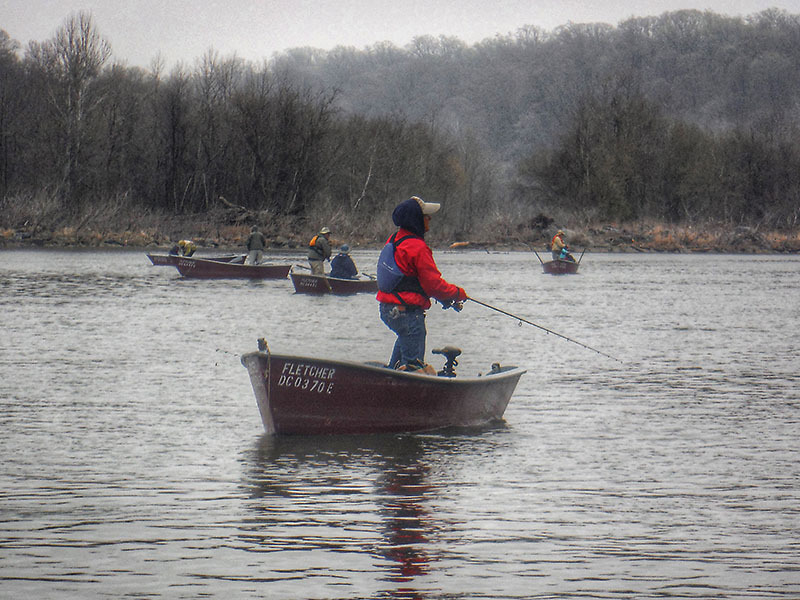 Almost an hour later, as the sun began to climb above the tree line, I felt the first tug just as a large group of anglers made their way out of the cove and began to string themselves out across the river. It was a Hickory shad and it was holding deep. I fished the same spot and pulled in a few more fish before the bite cooled off. This pattern repeated itself throughout the day and was almost an exact repeat of the fishing action on my previous fishing trip. I would pull in a bunch of shad, then the bite would die off. About 15 to 20 minutes later, they were back. The color and size of the fly did not seem to matter. I caught shad on all colors although they did seem partial to the green and orange ones but not by much. Size 2 to tiny size 10 flies--they ate them all. If the shad were behind the boat, they would eat if the fly was there too. As the tide began to peak the bite really died down so after landing one more Hickory I pulled the rock and headed back to the dock for a hot dog and drink.